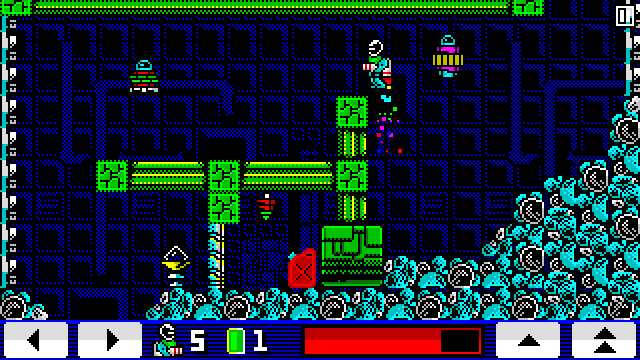 Indie Retro News: Jatpack Jaxx - ZX Spectrum inspired action platformer hits Android and Windows! Jatpack Jaxx - ZX Spectrum inspired action platformer hits Android and Windows! Just as I was about to go to bed, I get an update in our Game Dev : RetroGaming Facebook group, of a brand new game that not only has the look of a ZX Spectrum title, but instead was developed for both Android and Windows. This game titled as 'Jatpack Jaxx' and developed by Psyshteek, is inspired by classic ZX Spectrum games and according to the developer, is a simple action game that is completely free to play! As the description reads on the website, Fly with the backpack over the enemy base. Collect the cards and open the door. Use teleports and find your spaceship to escape. This is joyride with your jetpack. Play this game with retro 8-bit pixel graphics. This game has only the colors of Sinclair ZX Spectrum palette.